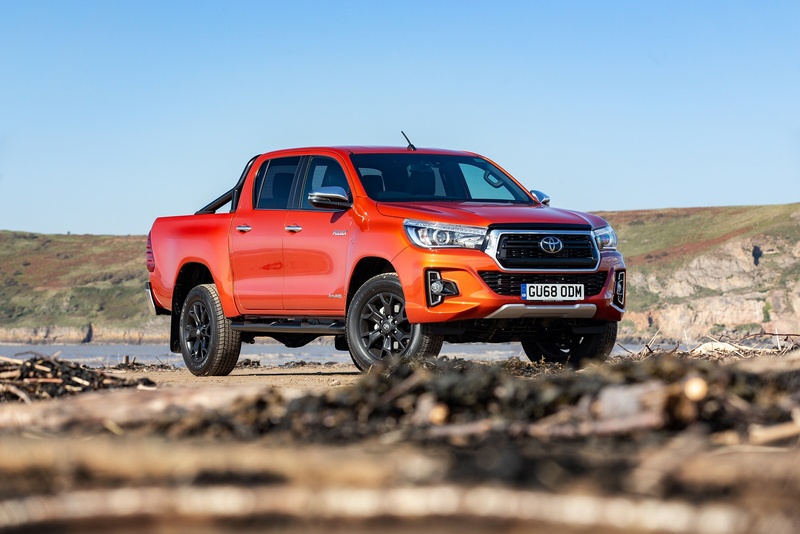 Although the Toyota Hilux has forged a reputation as something that cannot be killed, a little luxury inside still plays well with buyers and the latest eighth generation model serves up a more refined feel aided by its more sophisticated 2.4-litre turbo diesel engine. 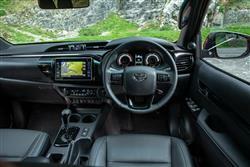 The styling changes also give it a more upmarket look yet prices have remained reasonable. 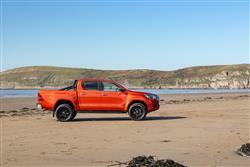 The Toyota Hilux found instant fame when Top Gear decided to crash one, have it washed out to sea, burnt and finally set atop a dynamited tower block and yet still it started and drove. This cemented a reputation for rugged durability that had built up over many years. Sheer cockroach-like indestructibility is an undoubted asset but the British pick-up buyer is looking for something more. With an increasingly sophisticated set of rivals, the Hilux needed to become a bit easier to live with. The improvements made to this MK8 model address that issue. Not only is it classier looking, but there's a more efficient 2.4-litre diesel beneath the bonnet, plus the interior feels a good deal plusher. 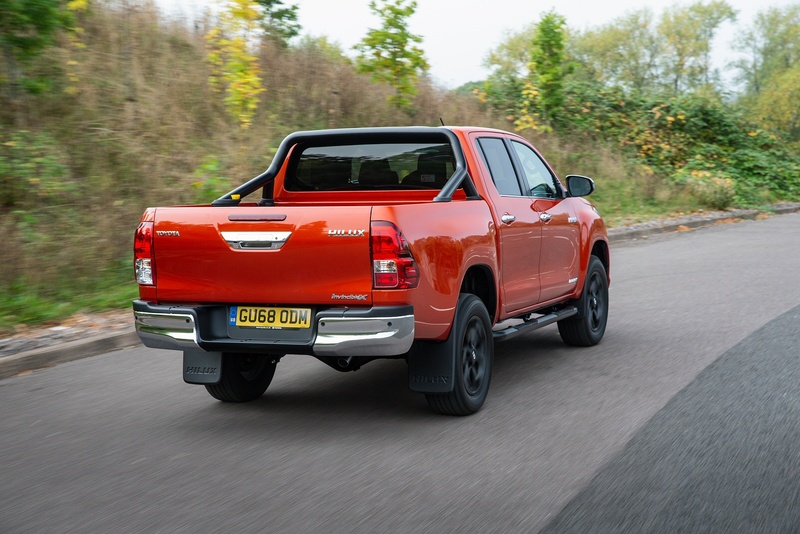 None of the Hilux's essential toughness has been compromised in the process but you might now value your pick-up too much to subject it to the worst excesses. 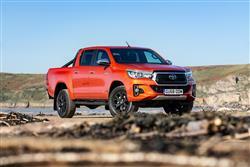 The key thing about this new-generation Hilux lies with the installation of its new 2.4-litre D-4D Global Diesel (GD) engine. With 400Nm of torque, pulling power is improved over the old 2.5 and 3.0-litre diesel units, plus there's enhanced efficiency too. All variants feature all-wheel drive, while the Invincible and Invincible X models at the top of the range offer the option of a six-speed automatic gearbox. Both transmissions have been extensively revised to improve durability and low-speed driving performance, with quieter, smoother gear changes. 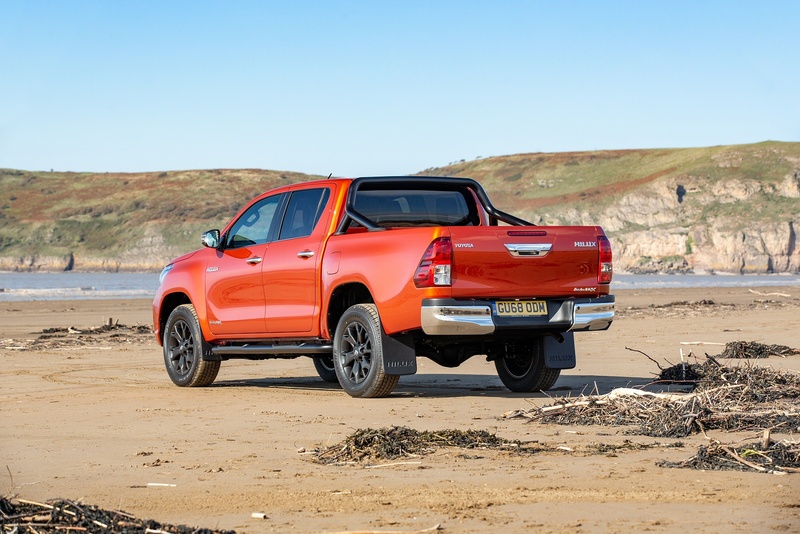 Both manual and automatic Hilux have a top speed of 106mph; acceleration from nought to 62mph is 12.8 seconds for the auto and 13.2 seconds for the manual. 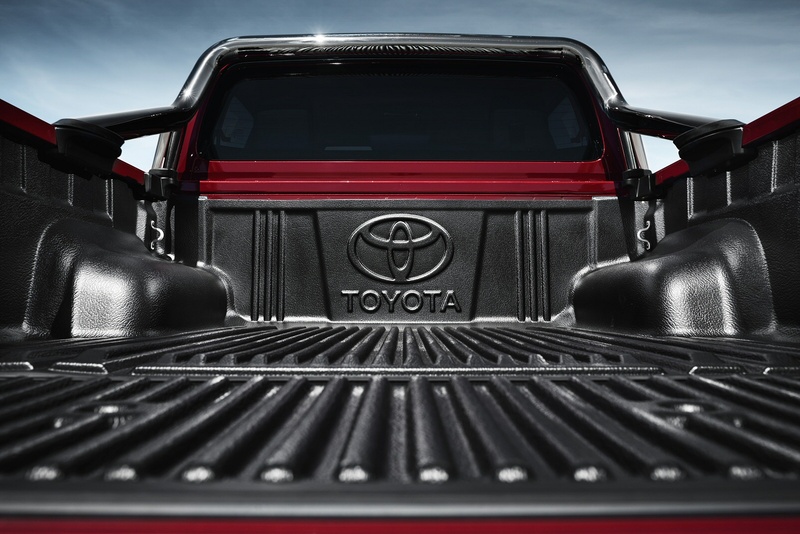 Under the skin, there's a new ladder-frame chassis that gives the vehicle a 20% increase in torsional rigidity, improving improved handling, ride comfort and refinement. The robust leaf spring and twin shock absorber rear suspension system has been extensively revised to provide off-road articulation capabilities and SUV-like ride comfort and handling stability. 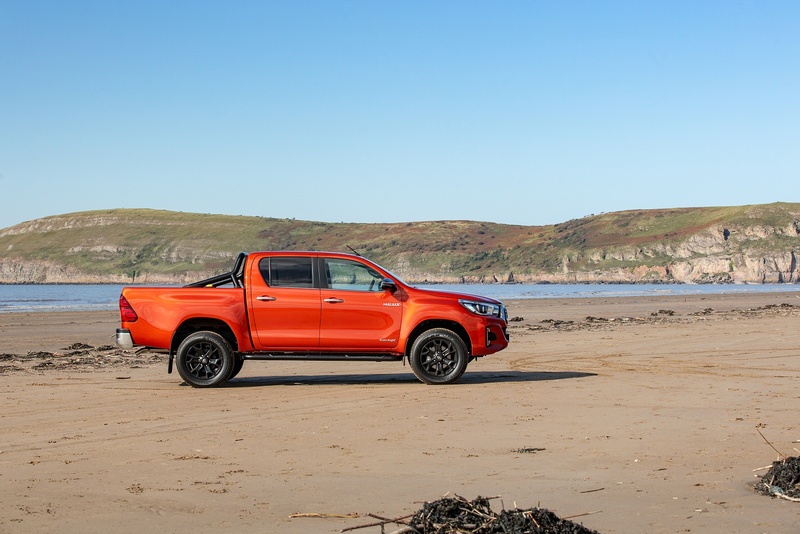 The Hilux is equipped with a switchable all-wheel drive system featuring a high and low-ratio transfer case, and both front and rear locking limited-slip differentials. 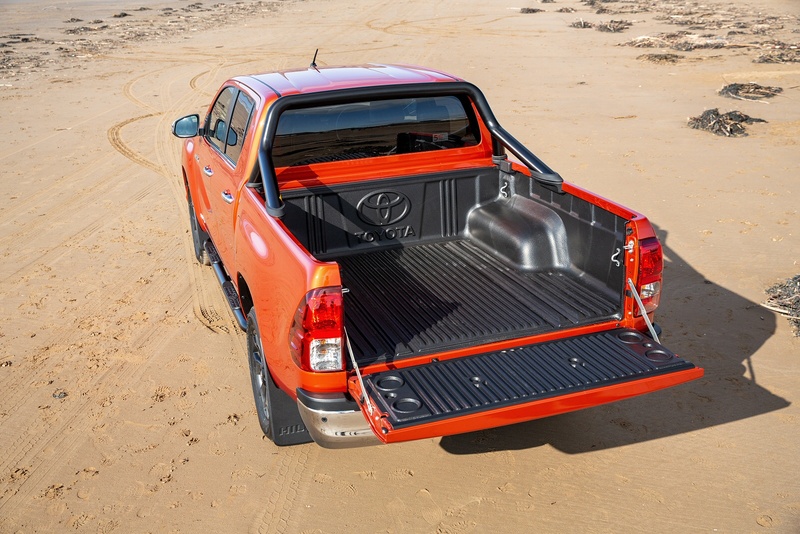 The improved low and medium speed torque delivery of the 2.4-litre diesel engine and the increased strength of the redesigned ladder-frame chassis together enable an increase in towing capacity to 3.5 tonnes. The most obvious change to the latest Hilux is its exterior styling. It's 75mm longer, 20mm wider and 45mm lower than before and aims to display its combination of toughness and refinement in a sleeker frontal design which features a unified arrangement of the upper grille and headlamps and a deeper bumper housing a large lower grille. The bonnet wraps over the front wheel arches to reinforce the vehicle's solid, road presence while the line of the second horizontal bar in the upper grille extends into the headlamp units to form a distinctive daytime running light arrangement, featuring 12 white LEDs. 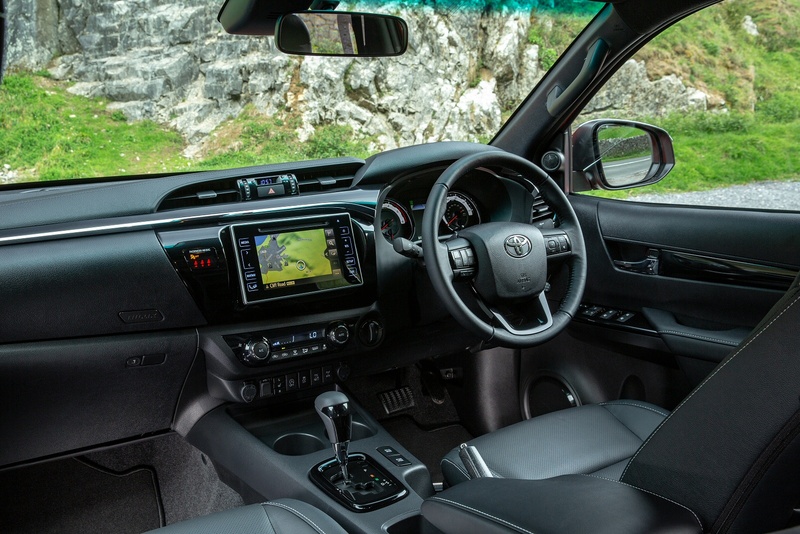 Inside, the cabin's been redesigned with the centre console now dominated on most models by the Toyota Touch 2 integrated, seven-inch multimedia touchscreen. The revised driver's instrument binnacle features large, analogue speedometer and tachometer dials either side of a 4.2-inch TFT multi-information display. 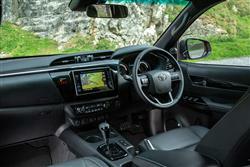 And the more premium appearance of the cabin is reinforced by metallic-effect details on the dashboard, door trim, instrument binnacle, steering wheel and gear lever bezel. A consistent blue tone has been introduced for the instrument backlighting. 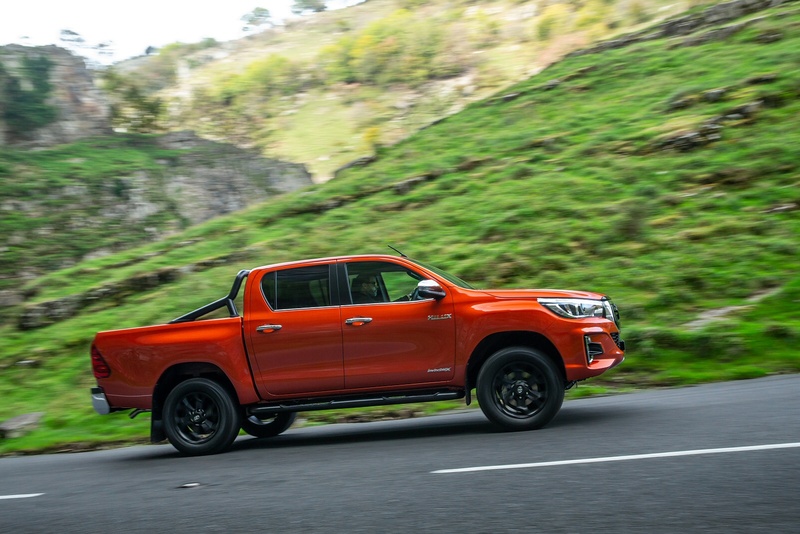 Prices range from just over £19,000 to around £30,000, excluding VAT and there's a choice of 'Active', 'Icon', 'Invincible' and 'Invincible X' trim levels. As before, the Hilux is being offered in Single, Extra and Double Cab body styles and prices start from just over £19,000 ex vat. 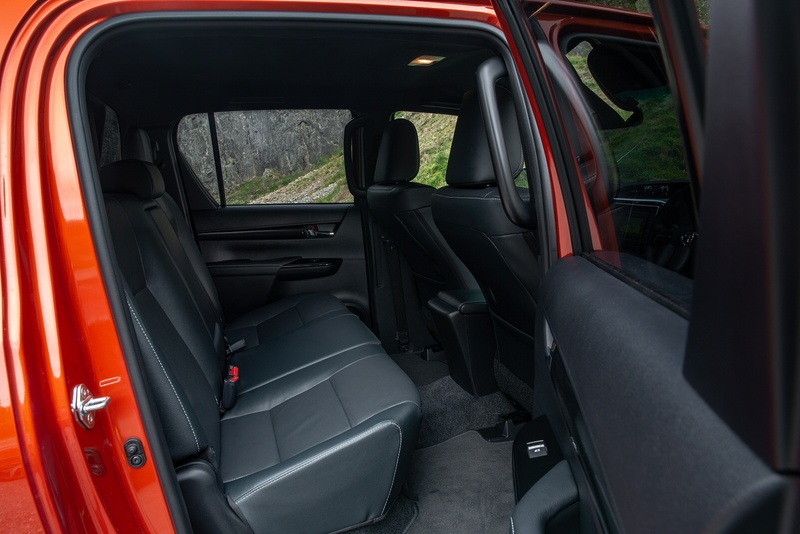 In keeping with their working vehicle profile, The Single and Extra Cab versions are offered only in the entry-level Active specification. 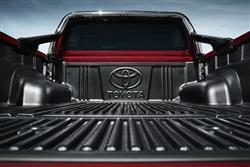 Double Cab models are available in all grades. All variants come decently equipped with Bluetooth, a cooled front storage box, driver and front passenger airbags with optional driver knee and curtain shield airbags. 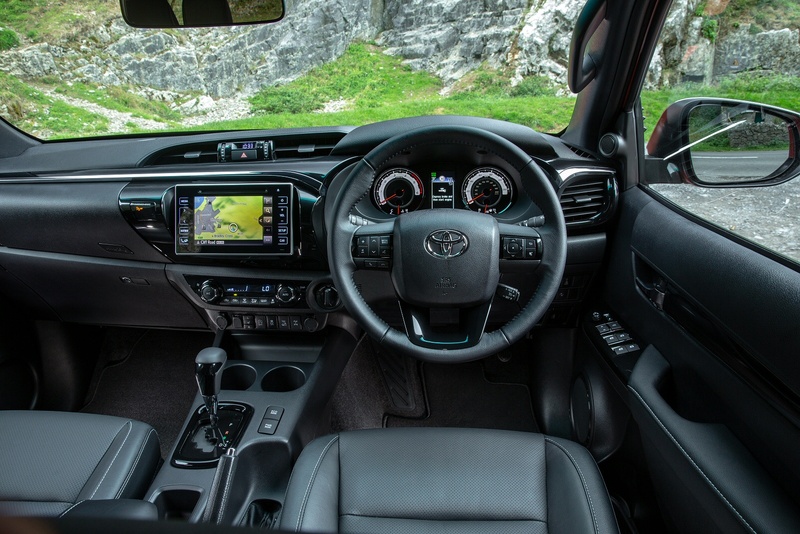 You also get Hill-start Assist Control, Downhill Assist Control, follow-me-home headlight function, turn indicators integrated in the electrically adjustable, heated door mirrors and Isofix child seat anchors on the Double Cab model. At the top of the range, there are features like Smart Entry and Start, LED headlights, automatic headlamp levelling, electric steering wheel adjustment, Vehicle Stability Control and a locking differential. Plus niceties like 18-inch alloys, automatic air conditioning, dusk-sensing headlights and chrome side bars with steps. Toyota's 'Safety Sense' package has also been added to the range, providing a Pre-Collision System, Lane Departure Alert, Automatic High Beam and Road Sign Assist. If you�re looking for a new Toyota Hilux Diesel Icon D/Cab Pick Up 2.4 D-4D [Nav] [3.5t Tow] for sale, you�ve come to the right place. 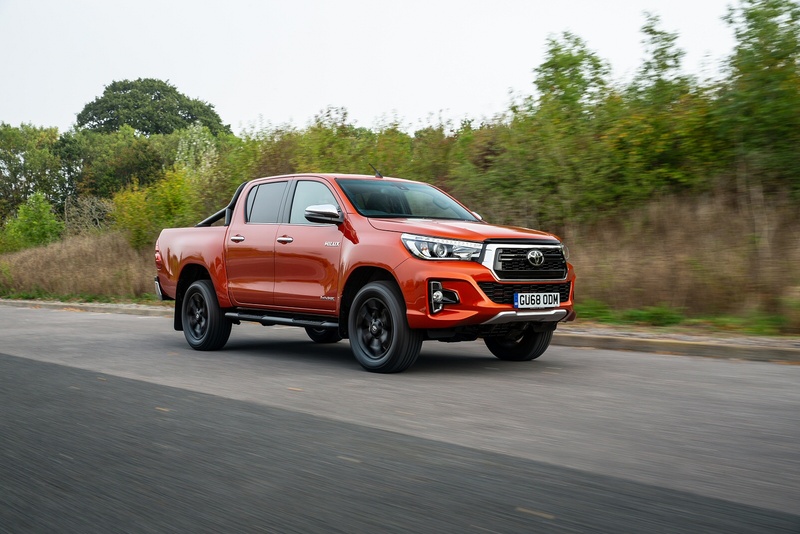 At Bristol Street Motors we don�t just have the best Toyota Hilux Diesel Icon D/Cab Pick Up 2.4 D-4D [Nav] [3.5t Tow] deals, we also offer friendly advice and help with all your enquiries to ensure your buying experience is a happy experience.